Augustus created a standing army, made up of 28 legions, each one consisting of roughly 6000 men. Additional to these forces there was a similar number of auxiliary troops. Augustus also reformed the length of time a soldier served, increasing it from six to twenty years (16 years full service, 4 years on lighter duties). Unlike the Republican legions, which were more temporary citizen-levies for the duration of particular wars, Augustus created a professional army with legions becoming permanent units composed of career soldiers. Under the late Republic, a Roman citizen (i.e. male of military age: 16–46 years) could legally be required to serve a maximum of sixteen years in the legions and a maximum of six years consecutively. The average number of years served was about ten. In 13 BC, Augustus decreed sixteen years as the standard term of service for legionary recruits, with a further four years as reservists (evocati). In AD 5, the standard term was increased to twenty years plus five years in the reserves. Augustus’ the legions were transformed from mixed conscript and volunteer corps soldiers serving an average of 10 years under the Republic, to all-volunteer units of long-term professionals serving a standard 25-year term. (Conscription was only decreed in emergencies). The standard of a legion, the aquila (eagle) was the very symbol of the unit’s honour. The aquilifer was the man who carried the standard, he was almost as high in rank as a centurion. It was this elevated and honourable position which also made him the soldiers’ treasurer in charge of the pay chest. A legion on the march relied completely on its own resources for weeks. In addition to his weapons and armour, each man carried a marching pack that included a cooking pot, some rations, clothes and any personal possessions. Furthermore, to make camp each night every man carried tools for digging as well as two stakes for a palisade. Weighed down by such burdens it is little wonder that the soldiers were nicknamed ‘Marius’ Mules’. In the period following its introduction, the new term was deeply unpopular with the troops. On Augustus’ death in AD 14, the legions stationed on the rivers Rhine and Danube staged major mutinies, and demanded, among other things, reinstatement of a sixteen-year term. 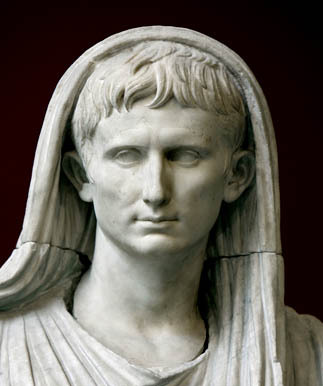 Augustus prohibited serving legionaries from marrying, a decree that remained in force for two centuries. This measure was probably prudent in the early imperial period, when most legionaries were from Italy or the Roman colonies on the Mediterranean, and were required to serve long years far from home. This could lead to disaffection if they left families behind. But from about AD 100 onwards, when most legions were based long-term in the same frontier-province and recruitment was primarily local, the prohibition of marriage became a legal encumbrance that was largely ignored. Many legionaries formed stable relationships and brought up families. Their sons, although illegitimate in Roman law and thus unable to inherit their fathers’ citizenship, were nevertheless frequently admitted to legions. At the same time, the traditional grant of land to retiring veterans was made replaceable by a cash discharge bonus, as there was no longer sufficient state-owned land (ager publicus) in Italy to distribute. Unlike the Republic, which had relied primarily on conscription (i.e. draft), Augustus preferred volunteers for their professional legions. Given the onerous new term of service, it was necessary to offer a substantial bonus to attract sufficient citizen-recruits. In AD 5, the discharge bonus was set at 3,000 denarii. This was a generous sum equivalent to about 13 years’ gross salary for a legionary of the time of about 230 denarii. To finance this major outlay, Augustus decreed a 5% tax on inheritances and 1% on auction-sales, to be paid into a dedicated aerarium militare (military treasury). However, veterans continued to be offered land instead of cash in Roman colonies established in the newly annexed frontier provinces, where public land was plentiful (as a result of confiscations from defeated indigenous tribes). This was another grievance behind the mutinies of 14 AD, as it effectively forced Italian veterans to settle far from their own country (or lose their bonus). The imperial authorities could not compromise on this issue, as the planting of colonies of Roman veterans was a crucial mechanism for controlling and Romanizing a new province, and the foundation of veterans’ colonies did not cease until the end of Trajan’s (98-117AD) reign. But as legionary recruitment became more localized (by 60AD, over half of recruits were non Italian-born Roman citizens), the issue became less relevant. Augustus modified the command structure of the legion to reflect its new permanent, professional nature. In Republican tradition (but ever less in practice), each legion was under six equestrian military tribunes who took turns to command it pairs. But in the late Republic, military tribunes were eclipsed by higher-ranking officers of senatorial rank called legati (“literally “envoys”). A proconsul (Republican governor) might ask the senate to appoint a number of legati to serve under him e.g. Julius Caesar, Augustus’ grand-uncle and adoptive father, had 5, and later 10, legati attached to his staff when he was governor of Cisalpine Gaul (58-51 BC). These commanded detachments of one or more legions at the governor’s behest and played a critical role in the conquest of Gaul. But legions still lacked a single, permanent commander. This was provided by Augustus, who appointed a legatus to command each legion with a term of office of several years. The ranking senatorial military tribune (tribunus militum laticlavius) was designated deputy commander, while the remaining five equestrian tribunes served as the legatus’ staff officers. In addition, Augustus established a new post of praefectus castrorum (literally “prefect of the camp”), to be filled by a Roman knight (often an outgoing centurio primus pilus, a legion’s chief centurion, who was usually elevated to equestrian rank on completion of his single-year term of office). Technically, this officer ranked below the senatorial tribune, but his long operational experience made him the legion commander’s de facto executive officer. The prefect’s primary role was as the legion’s quartermaster, in charge of legionary camps and supplies. Augustus may have also been responsible for establishing the tiny cavalry contingent of 120 horse attached to each legion. The Augustan era also saw the introduction of some items of more sophisticated and protective equipment for legionaries, primarily to improve their survival rate. The lorica segmentata (normally called simply “the lorica” by the Romans), was a special laminated-strip body-armor, which appears on the Arch of Augustus at Susa (Western Alps), dating from 6 BC.